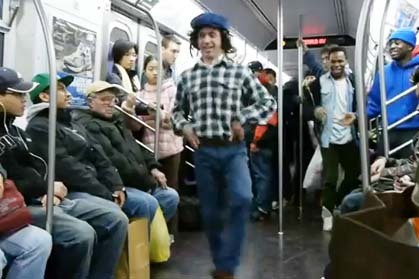 Running into break dancers on a New York City subway is nothing for most native New Yorkers to bat an eye at. However, for the break dancers to be upstaged by a faux Irish dancer? Comedian Tyler Fischer stole the spotlight from some break dancers on a subway recently when the music switched up to an Irish reel and Fleischer began to prance around the subway car. “Look at him go! He’s a little leprechaun!” cheered on the break dancers who were presumably in on the stunt. In our opinion the best part of this video isn’t Fischer’s fly Irish dance skills but rather how completely unphased the New Yorkers on the subway are about what’s taking place. Only in New York!